Geoff Marshall's Secrets of the Underground videos are now available as a totally Tube-tastic DVD just in time for Christmas. 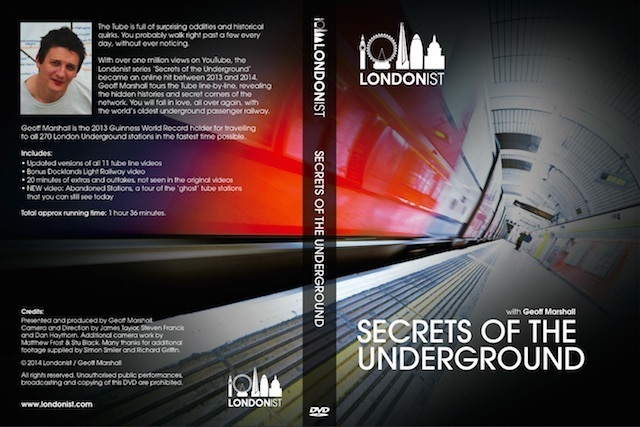 It includes the whole Secrets of the Underground series re-edited and polished up, bonus Docklands Light Railway video, PLUS a whole new, exclusive abandoned tube stations film (12 minutes long) — currently only available on this DVD — and 20 minutes of outtakes and extras for the super-fans. This marvellous DVD costs £12 per copy.It is region-free and can be played anywhere in the world. Please note that we are no longer selling the DVDs through our website. If you're interested in getting a copy, you can find Secrets of the Underground DVD on sale both at London Transport Museum shop and Museum of London shop. For any question, please email shop@londonist.com. Browse previous suggestions and see what we recommended last year.